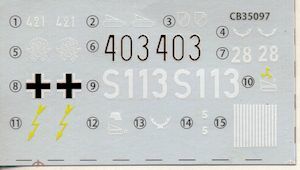 The Marder II came in two major versions. The first version Marder II (Sd.Kfz. 132) was based on the light Panzer II Ausf. D/E and Flammpanzer II chassis with Christie suspension. It was armed with captured Soviet 7.62 cm guns, re-chambered to accept German 7.5 cm Pak 40 ammunition, which improved its penetrative capabilities. These early Marder IIs had a very high silhouette (2.60 m high), thin armor of only 30 mm (front) and 10 to 15 mm (sides). There was no armour on the top or rear, leaving the crew with very little protection. 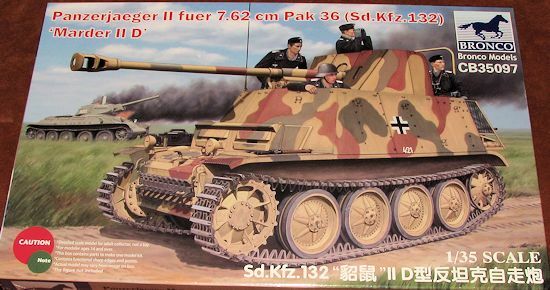 Alkett and Wegmann produced 201 Marder II (Sd. Kfz. 132) from early 1942 to early 1943. 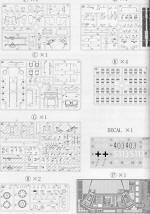 This kit is of this early version with the captured Soviet guns. 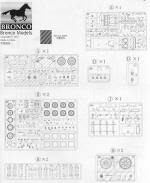 Those of you with experience building Bronco kits know that they are some of the best molded and finest detailed armor kits around and this one is no exception. The box is nearly bulging with tan s prues, all superbly molded with no molding glitches. Due to the nature of the vehicle, Bronco has added a driver's compartment that was also used to store ammunition. This is a nice thing to do as you will be able to see this area through the open hatches in the front (should you decided to mold them open) as well as through the very front of the fighting compartment. In addition to the driver's seat, there are ammunition storage lockers and the very large transmission that fits into this section. Because there is an interior of sorts, the main suspension bits will need to be trimmed a bit as they will no longer be free to jut into the hull area as far as with the non-interior kits. In the back of the hull is the rather complex engine intake/exhaust area. There are also a myriad of tools and supports to fit onto the fenders. The latter to hold up the plate that goes around the fighting compartment. The engine hood area has separate hatches as well, but with no engine to see, you will want to model these closed. As one expects, this kit has separate track links to provide the best realism. The fighting compartment walls have racks on the inside for more ammunition and there are also a pair of seats at the rear for the commander and the loader. Now seems like a good time to talk about the photo etch fret for in addition to the usual hand holds and such, there are some large screens that wrap around the rear of the vehicle. P.e. is also used for the muffler guard. The main gun is a small kit in and of itself. It is designed to be able to be moved in elevation and it has the ability to be moved back into the recoil position as well. The gun shields are nicely formed and have positive support. The barrel lock can be modeled closed around the barrel for travel or open for firing. Bonus bits are several wooden ammo crates and shells. There are a total of nine different painting options which run the gamut from overall panzer grey to tan with green and brown splotches of various designs. The options include the Panzer Grenadier Division 'Grossdeutchland' in 1943, several unknown units, Panzerjaeger ersatz-und Ausbindungseinheit, LAH Division in France during 1942, Wiking in September 1943, 16th Infantry Division, and H.Pz.Jg ABT 611 also in Russia. 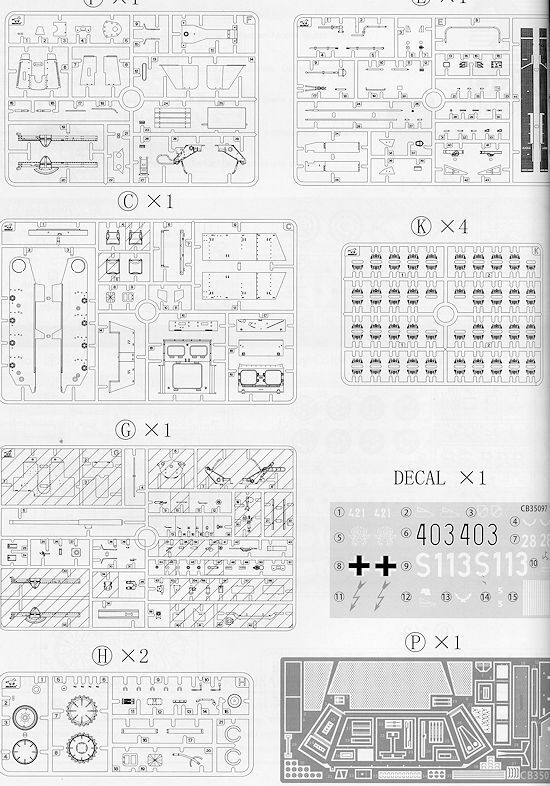 The decal sheet is nicely printed and provides those few markings that are needed for the option of your choice. 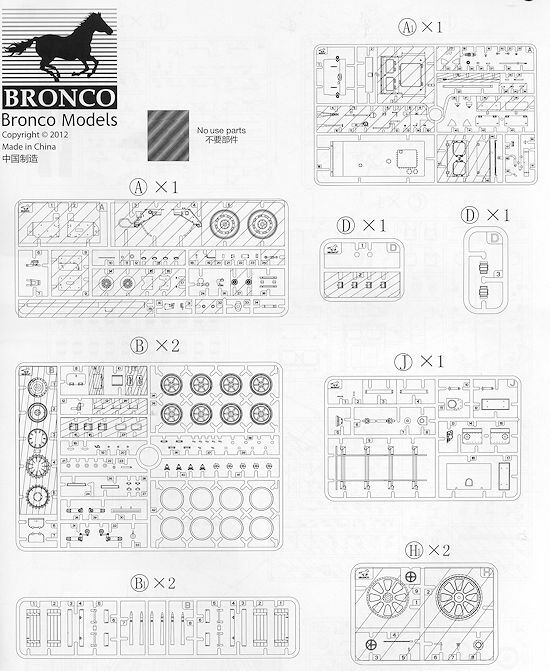 This adds another superbly detailed military vehicle to the Bronco catalogue. It will not be a quick build, but the engineering is very good and the end result will be a very impressive vehicle to add to your collection.